Spiders can evoke nightmares and cause many people to pause or scream. For us, they are friends. We have plenty of them in the garden and some in the house which we don’t mind as long as they stay in the corners. I should point out that they keep the house flies in check for us. The webs they create always fascinate me especially when there is dew on them. 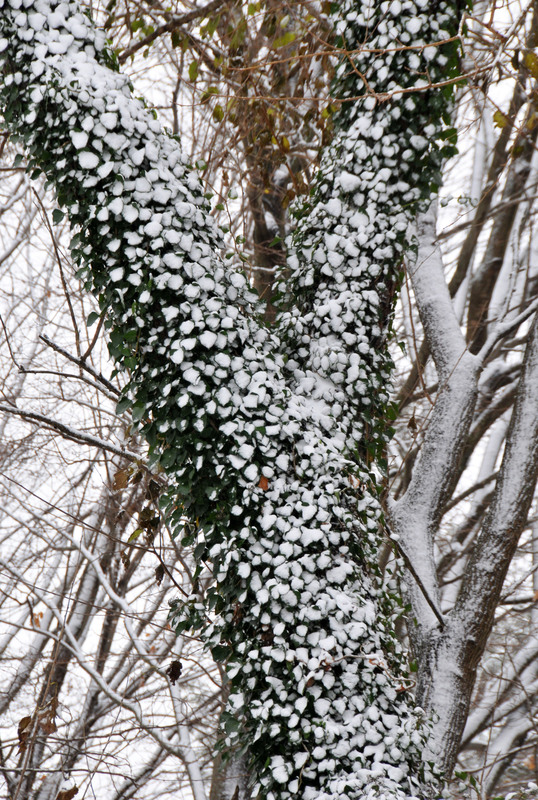 Tomorrow, December 22 will be the official first day of winter but Mother Nature didn’t get the memo. Day time temperature will be over 50° F for the next few days and night time will not be much lower than that. In fact, in this area Christmas Eve is predicted to be 70° F during the day. 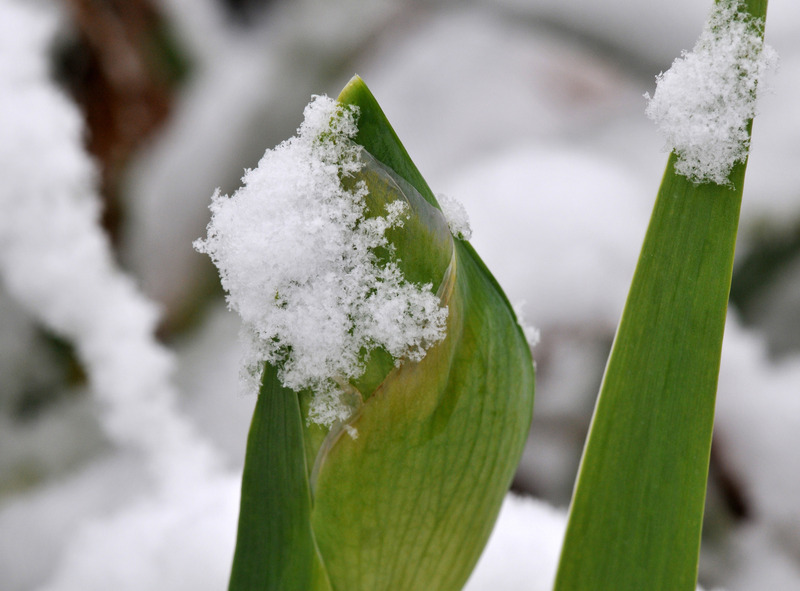 The sad part of this unseasonably warm winter is that plants and animals are fooled by it. They base their life cycles on the seasonal temperature changes. When it’s cold they hibernate or go dormant in order to conserve energy when food is hard to find. But when it’s too warm bears will come out from hibernation. Cherry trees will bloom in Brooklyn. Our honeybees came out looking for food too. Luckily they are domesticated so we feed them. But what happens to the wild honeybees? There are no flowers for then to get nectar or pollen from. Aside from our bees, plants in our garden are also fooled by this weather. I don’t know what this winter will turn out to be. If the ‘rural legend’ of Wooly Bear caterpillars (Pyrrharctia isabella) hits the mark most of the time, this winter should be a warm winter. According to the text in ‘Caterpillars of Eastern North America‘ by David L. Wagner, the legend says the width of the orange band can be used to predict the severity of the upcoming winter; the narrower the band, the colder the winter. This Wooly Bear on my glove told me the winter will be pretty warm, see how wide the orange band is. But maybe he was just stretching. I found this Wooly Bear caterpillar in our garden this autumn. Cute little guy. It has been five months since I posted last. Aside from busy with work and garden, my doctor advised me to spend less time in front of the computer. Bursitis and pinched nerve have been giving me aches and pain in my shoulders and arms. So after a long day of sitting in front of a computer at work, sitting in front of one at home is not recommended. Surprisingly enough, doing garden chores helps to ease the discomfort and after some routine exercise I’m back. Autumn is almost gone and we are ready for winter. All the tropical plants are down in their basement winter camp and the beehives are wrapped up to keep the girls snug. All the leaves are gone but there are some flowers left in our garden and the Saffron is one of them. We are growing Saffron (Crocus sativus) for the first time and they are blooming. I’ve been collecting their threads (stigmas) almost daily and dry them on a paper towel for a couple of days before preserving them in the vial. They have such a subtle scent. I’m not sure I can leave them outside during winter. Winter here can be brutally cold (down to -4F last winter). They’re in pots now and I plan to put them in the garage once the temperature drops below the freezing point. Hopefully they’ll grow back and bloom next autumn so I don’t have to pay a hefty amount for just a few threads. After we finished preparing our beehives for the winter, putting a cold frame over the winter vegetable plot and cleaning up most of the leaves it’s time to focus on our avian pals. We don’t feed them in summer because we don’t want them to depend on us completely for their survival and we want them to have some incentive for pest control in the garden. But when insects die out or hibernate underground and flower seeds and fruits wane, it’s time for us to return the favor. It’s only fair. We’ve been carrying on a symbiotic relationship since I started gardening. 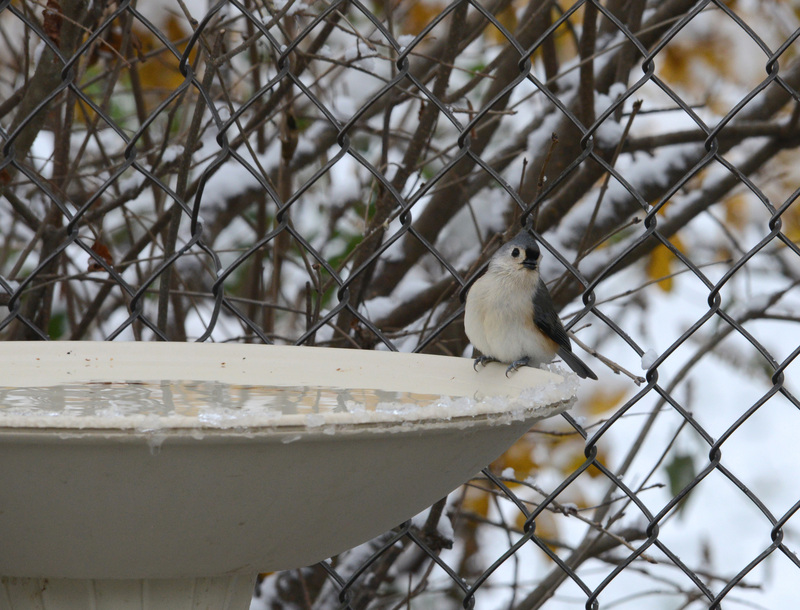 Late autumn and winter is also the time the birds make a truce with one another for their own survival. The territorial line is diminished, no need to defend a non-existence. No female to impress, no kids to protect…they only need food, water, shelter and to avoid becoming food themselves. Blue Jays (Cyanocitta cristata) will steal other birds eggs or chicks during breeding season so other birds never let them get close. 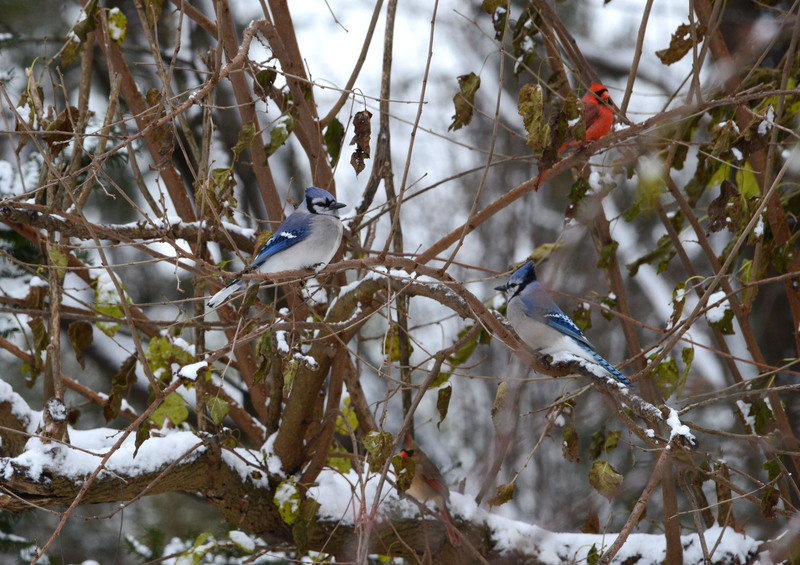 Still, small birds depend on Blue Jays to give them warning when there is a hawk around. Blue Jays sometimes even gang up on a hawk. 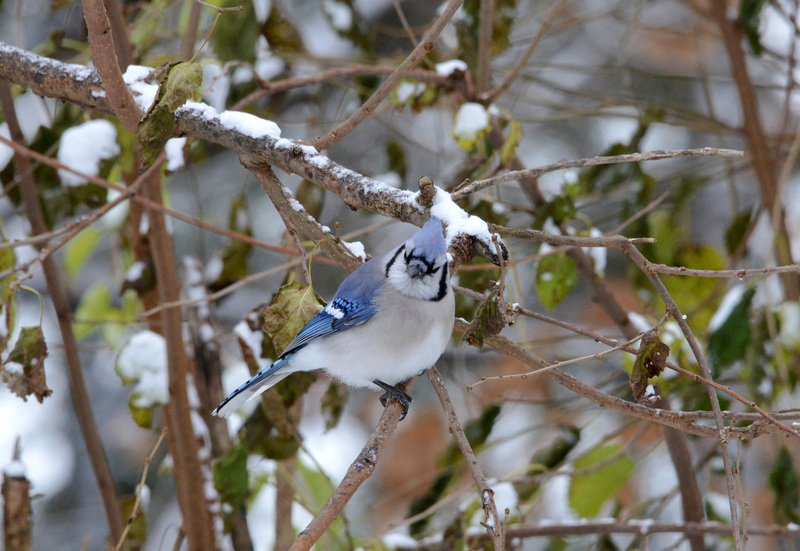 But at this time of year smaller birds seem to welcome the company of Blue Jays. Northern Cardinals (Cardinalis cardinalis), especially the males, are very territorial during mating season. I’ve seen them chase one another in the garden far too many times. In winter, however, both males and females stay together in a flock. 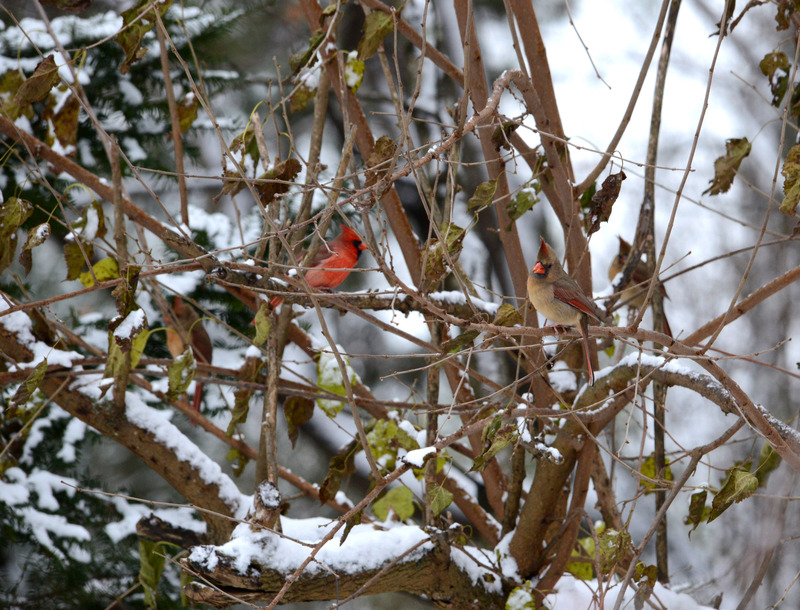 One year, our Forsythia bush lit up with twelve male Cardinals looking like Christmas ornaments in the snow. Three females and one male, above, were waiting for their turn at the feeder. I woke up this morning to see snow falling outside. 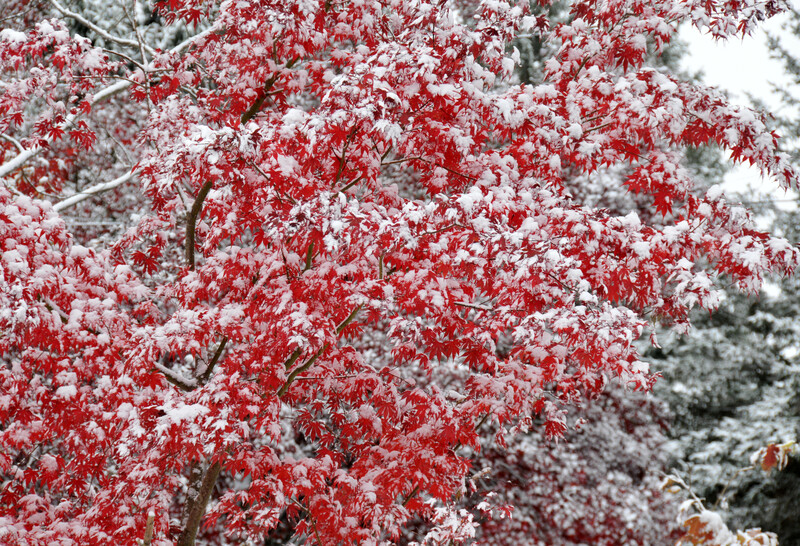 The temperature is cold with no wind so the snow stayed on the leaves and on the ground. Lucky that I’ve gotten everything I needed done in the garden before the weather got cold and snow fell. We insulated our beehives only last week, good for us and the honeybees. We also put up a cold frame for the first time this year and getting it in last weekend. We weren’t looking forward to hammering poles into frozen ground! We can now grow winter vegetables like Kale, Swiss chard and Arugula in there. I’m not sure how well this will work but I want to try growing hardier vegetables year round if I can. Anyway the sight of snow on the ground, trees, leaves and flowers is a reminder of the omnipresence of beauty year ’round. A flower bud of re-blooming iris that will not have a chance to blossom.